The story of Flamenco and the story of El Jaleo are intertwined: John Singer Sargent loved Spanish Gypsies and the culture so much he would say he was half-gypsy. Sargent himself was descended from a different persecuted minority: the Jews. Some say that his Jewish background may have helped him understand gypsy culture. Flamenco is more than a musical genre and dance: its origins are embedded in the culture from which it springs. The Gypsies are an ethnic group who originated in North India and arrived in Europe around the beginning of the second millennium. They are known for their music and dance and some believe that they originate from a caste of entertainers and musicians back in India. Flamenco was driven by the social forces of cultural oppression, much like American Blues music. Although there are many versions of Flamenco, the earliest is believed to be the cante jondo, the style that Sargent so eloquently captured in El Jaleo. In its original form, a lone male voice sings of sadness and oppression. Originally performed in caves or their equally modest homes in Andalusia, the singer eventually came to be accompanied by a stick smacked rhythmically against a gourd, and then later a guitar and dancer. In the mid 1800s, entrepreneurs realized the commercial value of Flamenco and began to book Flamenco performers for their nightclubs in Spain. Over time, the dancer's costume and attractiveness began to be emphasized, along with musical sequences that allowed for theatrical dance moves. 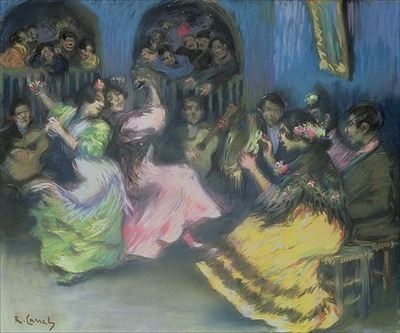 However, Sargent managed to capture the true spirit of Flamenco, while it was popularized but not yet commercialized. Sargent made the preliminary sketches for El Jaleo while in Spain in 1879. While studying the paintings of Velasquez, he became entranced by the Flamenco music he heard in nightclubs and translated his impressions onto the sketchpad. However, Sargent did not work on the actual painting until three years later in his studio in Paris, using professional models who were neither Gypsies nor performers. In light of the time that had past and the artificial setting in which El Jaleo was painted, the compositional and emotional accuracy of the piece are astounding. Sargent submitted El Jaleo to the Paris art exhibit, the Salon, in 1892, along with Lady with the Rose, a conventional society portrait of a nineteen-year-old woman. 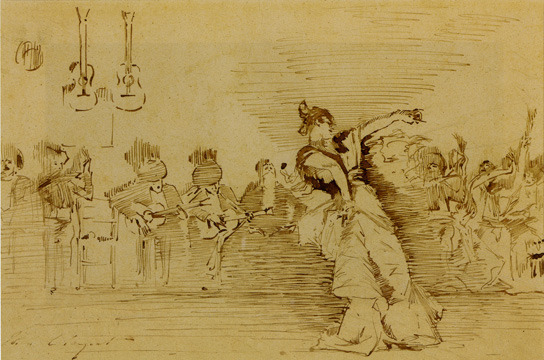 The influences of El Jaleo were none other than Spain itself: its music (Flamenco) and its master artists (Diego Velasquez and Francisco de Goya). These two great Spanish masters broke a lot of artistic ground during their heyday, which paved the way for later artists such as Sargent. While studying their works, Sargent became captivated by flamenco. Flamenco is both a genre of music and dance from Spain, its' earthy sensuality and mystery spring from its origins as an art form invented by cave-dwelling gypsies. Velasquez, the great Spanish master of the 17th century, influenced many Realist artists, those dedicated to depicting the truths of the modern world. 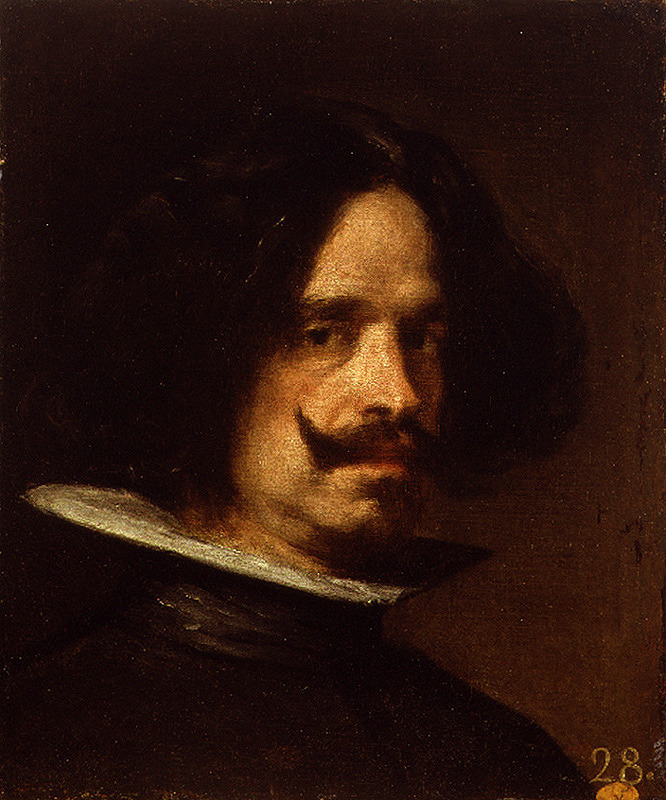 Velasquez was known for his psychological cunning in capturing the personality of his subjects. Sargent did not strive for such an in-depth effect, but he was equally skilled at capturing the essence of his themes. 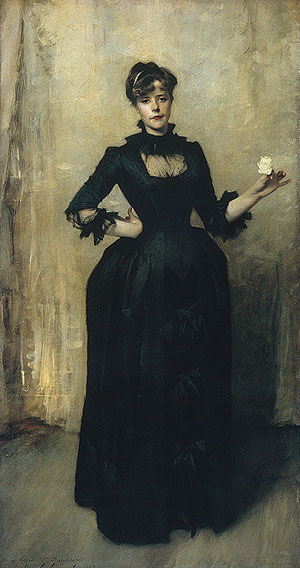 Sargent also applied many of Velasquez's techniques to his work, such as doing away entirely with under-painting and under-drawing in favor of painting directly onto the canvas. His principal reason for visiting Spain was to study Velasquez's works in person. Goya was known for capturing the deep emotionalism of events such as the Peninsular War. 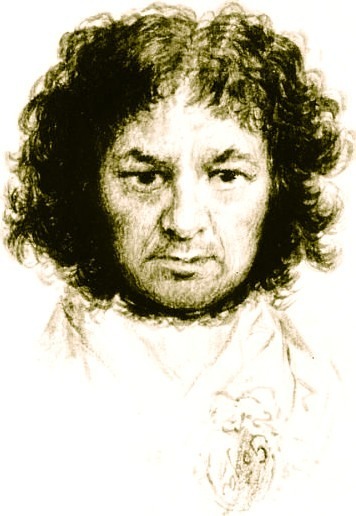 Goya was also known for his sharp color palette and the dramatic uses he made of light and shadow in his paintings, a style that Sargent uses in El Jaleo. Goya was one of the earliest artists to move away from the church/state dynamic in painting and the staged settings of the waning Rococo art movement, which paved the way for the Realist style that Sargent was known for. In El Jaleo Sargent captures the original spirit of Flamenco, an art form invented by a despised minority, the Gypsies, while dancing in caves or their equally modest homes in Andalusia. Its form is largely improvisational, drawing inspiration from the earthiness, melancholy, and passion of the gypsy lifestyle. 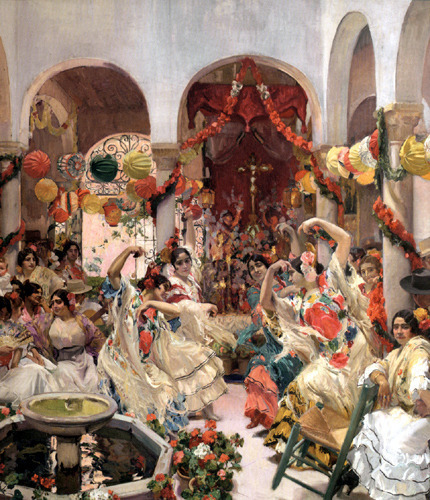 During the Golden Age of Flamenco (1860-1915), Flamencos' entertainment value was recognized. An orchestra replaced the lone guitar player, the singers' attractiveness and showy dance sequences were emphasized. 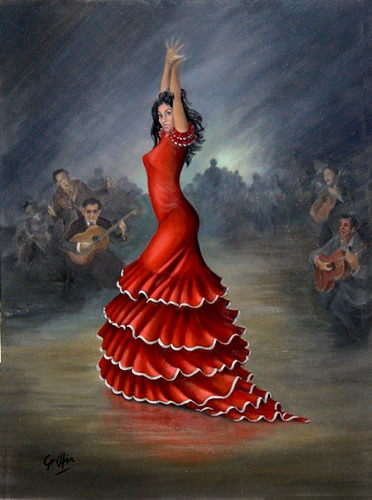 However, even though Sargent painted flamenco in a somewhat commercialized form, in El Jaleo, one can almost hear the music in the background. Sargent's El Jaleo has an addictive quality to it and the more you look at the canvas the more you want to see. Although an ardent lover of Flamenco, Sargent also had the art world in mind when he painted El Jaleo. Love of the exotic, particularly Spanish culture, was in vogue in Parisian art circles at the time. The dancer is off to the center right, which gives the effect of movement. The performers do not distract from her dramatic dancing, but add to the emotional effect, particularly the man in the center who throws his head back in a howl. The stage is on the eye level of the viewer, which gives the effect of feeling like one is in the performance. At the same time, the lighting, the result of flickering candles, makes El Jaleo seem mysterious and almost other-worldly. Black, gray and white - with occasional touches of red - is the standard Flamenco performance costume and so the colors of El Jaleo are limited because of Sargents' desire for accuracy. Lighting: The light in this canvas is caused by the flickering candles that lit up theaters at night during the days before electricity. El Jaleo is raw, gritty, and filled with a sad, mysterious energy as the performers mourn life but also celebrate it. The critical reception of El Jaleo has remained unchanged since it was first unveiled at the Parisian Salons' yearly exhibition. 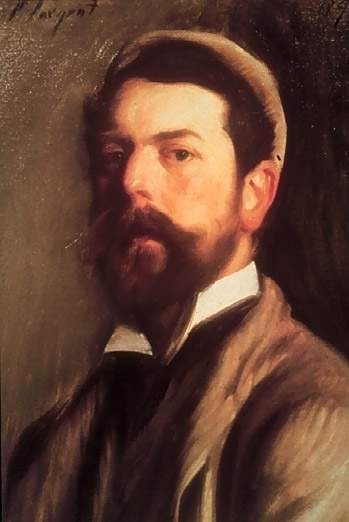 The portrait became the talk of Paris, along with John Singer Sargent. It appeals to viewers today in much the same way it appealed to 19th century viewers in Paris. It has even been embraced by Spanish Flamenco players, gracing the cover of several books on Flamenco and even one Flamenco dictionary. This is a huge compliment to the artist since Spanish Flamenco players have been loath to embrace foreign Flamenco enthusiasts. Notes one critic: "one of the most remarkable aspects of El Jaleo is its continuing resonance for casual observers and Flamenco aficionados alike." Despite its widespread acclaim, most of the commentary on the painting has been negative, even though viewers who supposedly didn't like El Jaleo couldn't help but make statements such as: "incontestably supreme among foreign artists in this Salon is M. John Sargent." Most of the criticism against this painting has been against its "artificial," "contrived" and "exaggerated nature. " Ironically, Sargent's painting is one of the most accurate among foreigners who painted in the genre. The line of horizontal figures behind the dancer is frequently criticized for being contrived, despite the fact that this is how actual performances look. The woman's posture has also been criticized as strange, the contorted right arm that holds up her skirt described as "anatomically impossible" although it is actually one of the most common poses in Flamenco. Her outstretched left arm was described as a "feverish and menacing gesture," perhaps because most of the art critics at the time were accustomed to the graceful daintiness of ballet. There are also several factual errors in the criticism, to the point that they describe things that are simply not there. The dancer is described as dancing to the castanets (bells) in her hands, when her hands are clearly empty. 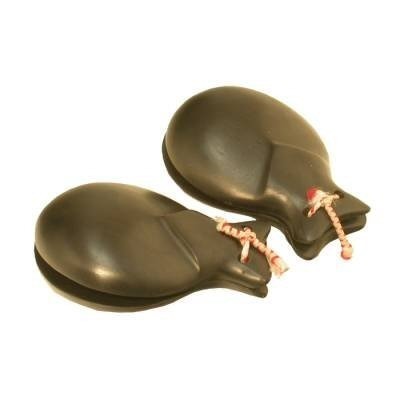 Furthermore, castanets are not even used in Flamenco. Critics were confusing Flamenco with Spanish folk and classical dancing. Also, several references are made to her mantilla, a Spanish head covering that she is obviously not wearing since her head is bare. John Singer Sargent created other works related to El Jaleo. He was not the only artist to be inspired by Flamenco and examples of similar works are shown here. The most obvious difference between El Jaleo and Sevilla el Baile is the tone. This is a different type of Flamenco, one that is joyful rather than sad. It is also a much more commercialized form: the costumes were originally in the palette that Sargent depicted, rather than in the brilliant colors adopted later on. The dancers' not only dominate the painting: the lack of musicians removes the dancers entirely from the context of the music. This painting was done more than thirty years after El Jaleo. By that time the dance had become known as a Spanish rather than Gypsy art form. By its title alone, Spanish Gypsy Dancers proves that it is trying to remain more faithful to Flamencos' roots. It helps that it was painted only 6 years after Sargent's masterpiece. The setting is humble, as in El Jaleo, and the dancers are placed in the context of the music. Like in Sargent's painting, the dancer takes center stage. Unlike El Jaleo, the viewer feels slightly distant from the performance because of the inclusion of the audience in the painting and the small distance from the stage. Spanish Gypsy Dancers' palette is more colorful but also more abstract. However, Ricardo Canals did include a good deal of somber brown and blue tones to give it a more authentic, gypsy feel. The woman in Spanish Gypsy Dancer (1879) is the one whom Sargent painted from memory three years later for El Jaleo. She is turned to the left instead of the right, but she is still in profile. The white skirt looks much the same it does in El Jaleo, and while the top is a different color, it still provides a dramatic contrast. The woman's expression is also much more cheerful and obvious. The difference in mood between the two paintings is captured perfectly by the day/night contrast of El Jaleo and Spanish Gypsy Dancer. 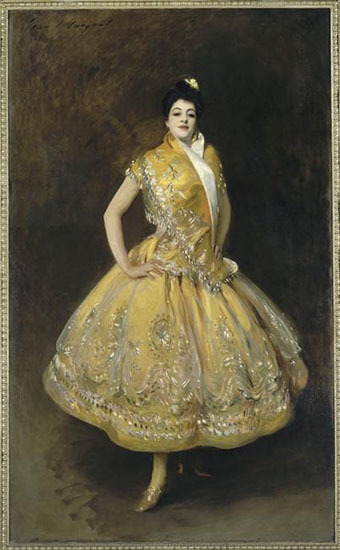 La Carmencita was a very interesting and colorful gypsy dancer whom Sargent met in Paris in 1880. Sargent captures her in two different ways; in the first she is haughty and regal, but there is an emotional depth to her. The brilliance of her yellow dress makes her stand out from the dreary background. In the second canvas, she looks like another figure entirely and this painting is much more abstract. The whirl of La Carmencita's dancing can only be conveyed by the abstract billowing of her costume. The intensity of movement is conveyed by the fact that she only seems to dissolve into the background. Together, these portraits provide a nice portrait of two different facets of Carmencita; in motion and at rest. Immediately after the exhibit Schaus & Company, a prominent New York company, purchased El Jaleo. However, their motivations were based more on profit than love of the painting itself. Schaus & Company immediately sold the painting to Thomas Jefferson Coolidge, a retired American diplomat. His good friend, Isabella Steward Gardener, insisted on having El Jaleo to display in her home. Eventually, Gardener turned her mansion into a museum. Since 1915, paying viewers have been able to see El Jaleo at the Isabella Steward Gardener Museum. John Singer Sargent painted El Jaleo at the beginning of his career, before he became famous for his portraits or watercolors. Sargent made the preliminary sketches for El Jaleo while he was in Spain studying the works of Spanish master Diego Velasquez. At the time, there was a heightened popularity for Spanish culture all across Europe. This was partially due to Spain's previous isolation from the rest of Europe, which was broken only in 1810 by the start of the Peninsular War. 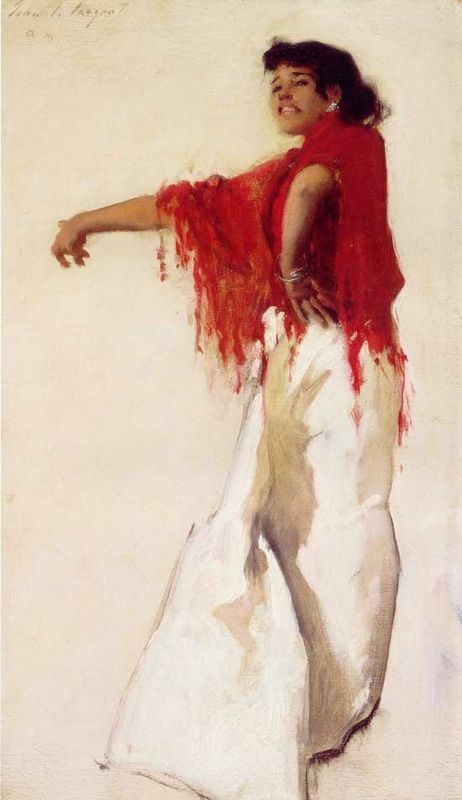 In El Jaleo, Sargent capitalized on this love of the exotic and his own love of Flamenco. John Singer Sargent was one of the last great Realists of his time. Realism turned to every day life rather than the historical for inspiration. It sprung up at the same time as modern-day journalism and both movements attempting to capture gritty, modern truth. In this regard, El Jaleo is an accurate rendering of the pathos and passion of the gypsy lifestyle that drives the Flamenco performance. You can find out more about El Jaleo by referring to the various literary sources listed below.